1. Sujal Charitable Trust Pre Event: "PAHERVESH" BEAUTY CONTEST (Breast cancer Awareness Campaign)- Date : 25 th April 2014. 2. Sujal Charitable Trust Pre Event: BREAST CANCER CHECK UP CAMP - MANJALPUR Date : 27 th July 2014. 3. Sujal Charitable Trust Pre Event: BREAST CANCER CHECK UP CAMP - WAGHODIYA ROAD Date : 11 st Jan. 2015. 4. Sujal Charitable Trust Pre Event: TREASURE HUNT CAR RALLY (Navigated by Blind)(Breast cancer Awareness Campaign) - Date : 8 th Fab. 2015. 5. Sujal Charitable Trust Pre Event: BREAST CANCER CHECK UP CAMP - GOTRI ROAD Date : 11 st March. 2015. 6. Sujal Charitable Trust Next Event: MEGA BREAST CANCER CHECK UP CAMP - MORE THEN 100 HOSPITAL Date : 10th May 2015. Sujal Charitable Trust is a non-profit making organization active in Vadodara since 2013 with the objective of uplifting the society in every aspect covering education, health, and serving the needy ones. We have henceforth, started "Mahavir Anna Kshetra" to feed the poor people every day. 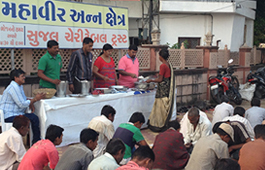 This Anna Kshetra feeds Gujarati preparation and on occasion of birthdays, anniversaries, death anniversaries people do contribute as per their wish to have some special serving too. We hereby try to fulfill the hunger of needy ones in society by doing our bit and receiving very warm response from the society too. Apart from "Mahavir Anna Kshetra", trust is actively involved in organizing several social camps on eating habits. 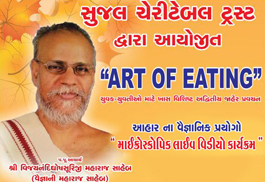 One such event named "Art of Eating" was successfully executed by Sujal Charitable Trust in January 2014 under the guidance of honorary Shri Vijaynandighosh Suriji Maharaj Saheb. He described scientifically about our hasty food habits due to hectic work life and its impact on our health. Sujal Charitable Trust organized a traditional beauty contest competition called "Pehervesh" for kids and women on April 25th 2014 at Sir Sayajirao Nagar Gruh Akota in order to spread awareness about breast cancer. In addition to this, Sujal Charitable Trust have actively executed three breast cancer check up camps with support of local hospitals and other willing organizations in July 2014 and January 2015. Statistics for both the camps organized are proof that over 1200 women collectively participated in both camps actively. Especially we are actively organizing breast cancer awareness programs since April 2014 with intention of bringing much needed awareness amongst women to have primary check up and also educate about the breast cancer disease, symptoms, and its curable treatment if detected in initial stage. 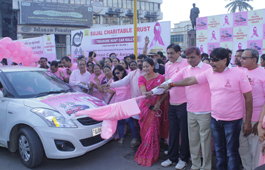 Trust also carried out a "Treasure Hunt Car Rally" in March 2015 for spreading awareness on breast cancer and to promote mega check up camp scheduled in May 2015 to ensure to control the spread of the dearth of breast cancer disease. This treasure hunt car rally was unique as in this rally participants were guided by blind people using Braille navigation technology. Interest shown by blind people was tremendous and it really encouraged trust and set an example to spread awareness about this dreadful breast cancer disease.